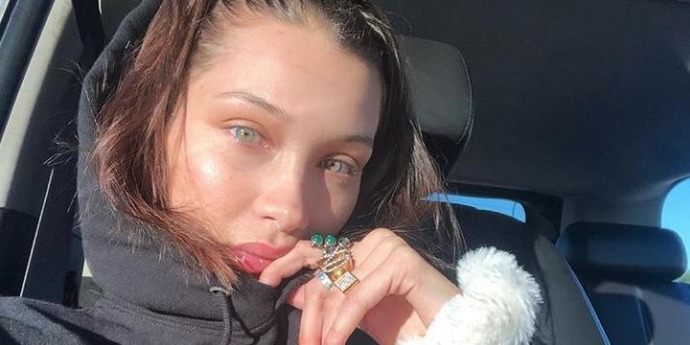 Bella Hadid's skin looks smoother and glowier than ever in her latest Instagram selfie-even without a stitch of visible makeup. The reason why isn't a product as much as it is a person with a line of products: "A big kiss and shout out to @bbsturm @drbarbarasturm for not only being the woman boss she is, but changing my skin forever with her incredible facials," the supermodel wrote on her Stories. And for all the skeptics out there, Hadid clarified that her post wasn't an ad. "Just the truth!!! Thank you Barbara," she added. Dr. Barbara Sturm is one of the top dermatologists in the world. Her eponymous brand of chic, minimalist skincare products can be found in the kits of every major makeup artist and on the vanities of supermodels celebrities, and influencers. Her clinic in Dusseldorf, Germany is said to have a waitlist (though she does do house calls fro celebrities around the world). At her clinic, patients can partake in every major anti-aging treatment (injectables, lasers, etc. ), including Sturm's signature vampire facial and blood-infused cream. Hadid previously told Elle that she was not a fan of facials, but that must have been in her pre-Sturm days. "I'm not really into facials. I usually go for a massage because my bones are always hurting. And I like getting body scrubs, just to kind of get Fashion Week scrubbed off," she said. The supermodel also has a killer travel routine for keeping her skin fresh. "I travel a lot and I often work directly after landing. I use my mom's advice, keeping my skin as good as it can be. So on a plane I wash my face as soon as I get on, I have all my serums and my night cream. And then I fall asleep and do it again when I wake up," she told British Vogue. "So by the time I get off the plane my face is well rested and moisturised. And I always have a concealer with me, especially when I'm super-tired to get those dark eye bags away." Taylor was the only guest not wearing jeans, but she is Taylor Swift.